… Continued from Tokyo Disneyland. 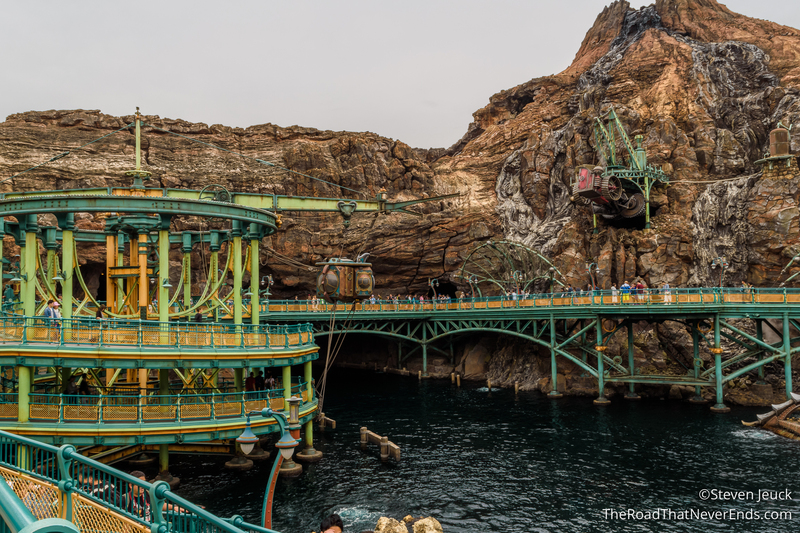 Tokyo DisneySea is themed after nautical exploration, with all areas of the park being “Ports”. The park isn’t overly “cute” or “cartoony” which is different than Disneyland. The park is cleverly decorated, and the theming is brilliant. 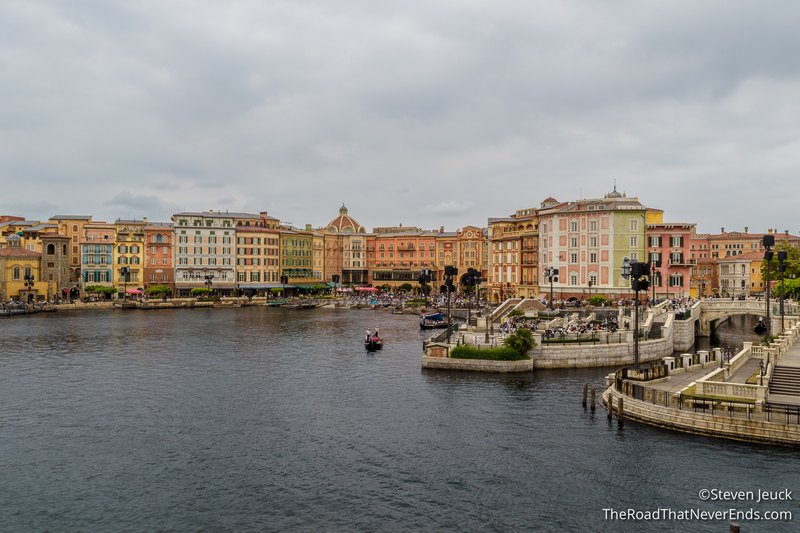 Mediterranean Harbor – Much different than other Disney parks, as there really isn’t a “Main Street”. Once you enter the park you approach the waterfront, and there are shops to both sides. The theme here is an Italian city and it is done well. The waterfront is also home to many daytime shows and Fantasmic at night. 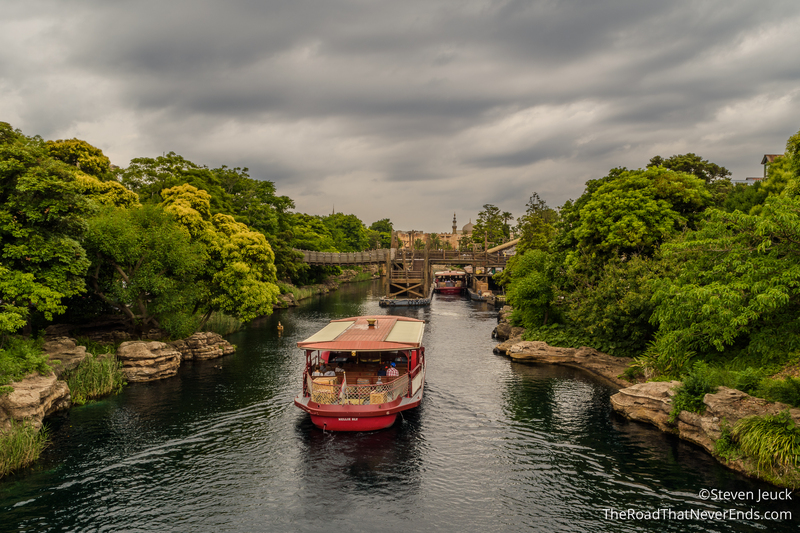 DisneySea Transit Steamer Line – One of the ways to get around the park is to travel by boat. Steve and I did this a few times and loved it. However, during shows they have a modified service and it doesn’t go completely around the park to avoid the show area. Fortress Explorations – This is meant to be an area for adults and children to do science related exhibits. There are many hands on features, including “shooting” cannons. The map to complete the puzzles and become a member of S.E.A. (Society of Explorers and Adventurers) is in Japanese. The little time we spent there was fun, but it was challenging as we couldn’t read any of the instructions. The attraction is well themed, and seemed to be well liked. It also includes a playground to toddler age kids. Venetian Gondolas – A very popular attraction here, we were able to sit, relax and be serenaded by our gondolier. This attraction has limited hours based on shows as well, so finding an open time was hard. We ended up waiting during a show next to the entrance and were the first in line once it reopened. 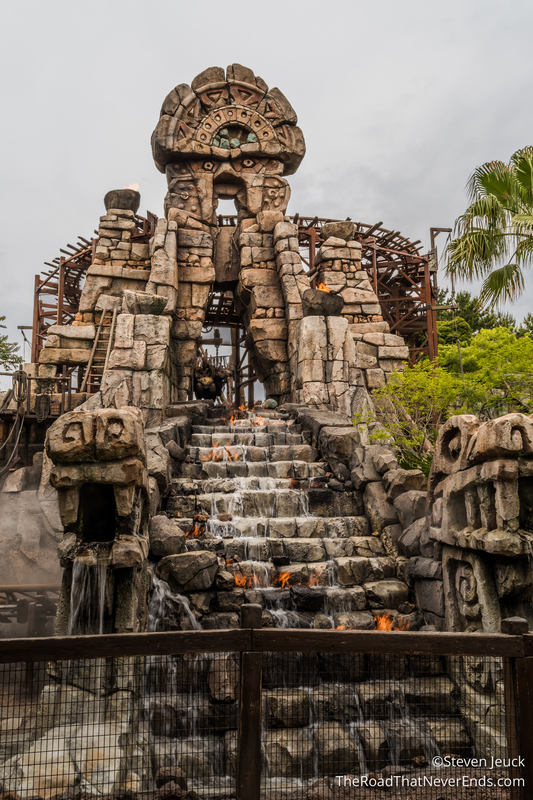 Mysterious Island – A tiny but incredibly themed area, just next to the main centerpiece of the park – Mount Prometheus. The area is themed to the Jules Verne book – The Mysterious Island, but plays homage to his famous fictional character – Captain Nemo. 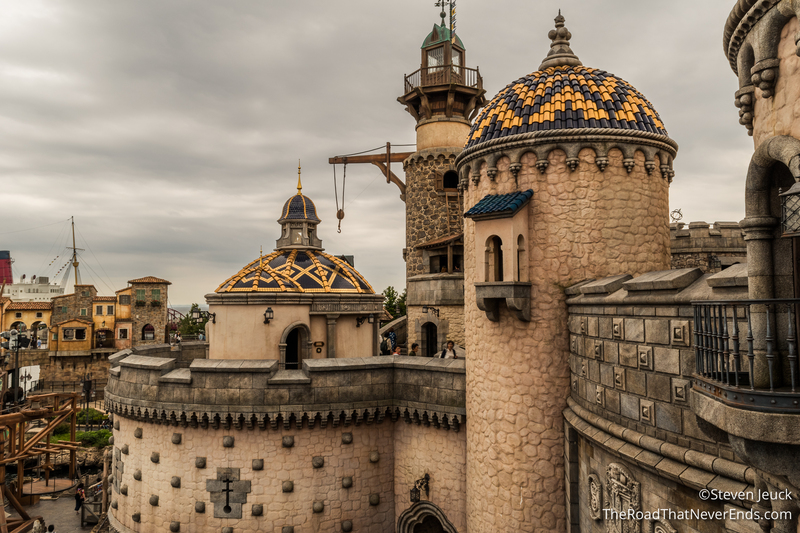 It wouldn’t be a surprise to know that the two rides based in this area are based on his other books – 20,000 Leagues Under the Sea (also a Disney Movie) and Journey to the Center of Earth. The area is constantly “smoking” and when the volcano erupts, the entire area gets loud and smokes a lot more. Fantastic theming! 20,000 Leagues Under the Sea – This dark ride had no wait throughout the day. The ride never enters water, but instead has the illusion it does. There are flashlights on board that allowed Steve and I to discover hidden fishes and monsters. The animatronics are truly amazing and very realistic. Journey to the Center of Earth – We rode this a few times with a fastpass. The ride uses the same technology as EPCOT’s Test Track and Disneyland’s Radiator Spring Racers. The journey starts with finding cute little creatures in mushrooms and other plants, and gradually you find a giant worm – with a big drop at the end of the ride. Steve and I weren’t sure what to expect but found ourselves really enjoying it to ride it a few more times. 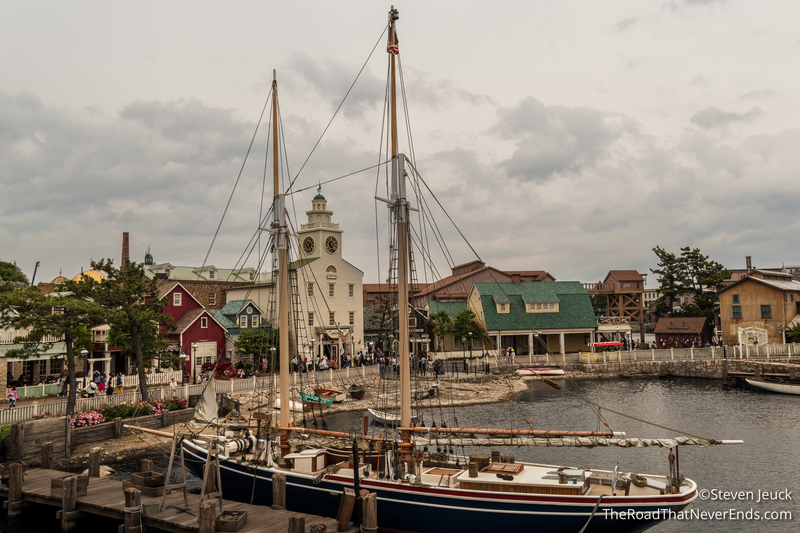 American Waterfront – This area has two distinct themes – Old New York and Cape Cod, with the S.S. Columbia as the main centerpiece. 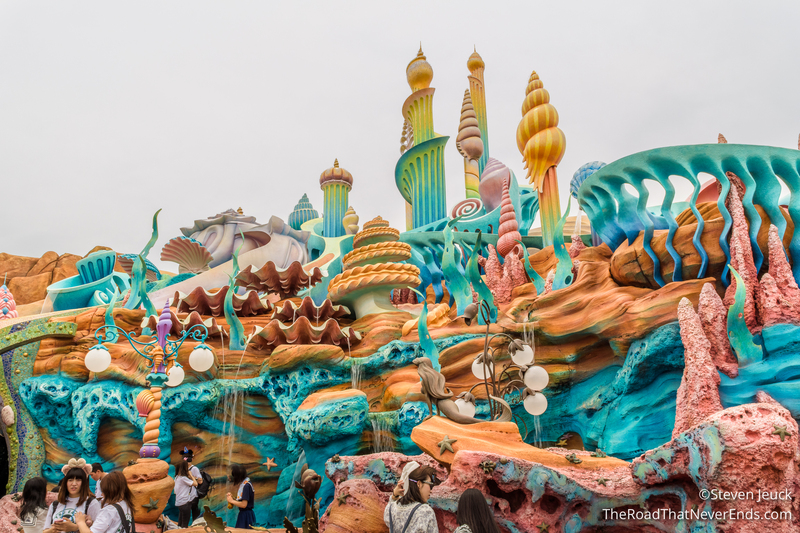 From Broadway, to a lighthouse fishing village – this area once again is well themed. This area is also home to the Duffy parade, and the Big Band Beat show. We were disappointed that during our visit Toy Story Mania was closed, which is one of Steve’s favorite attractions. 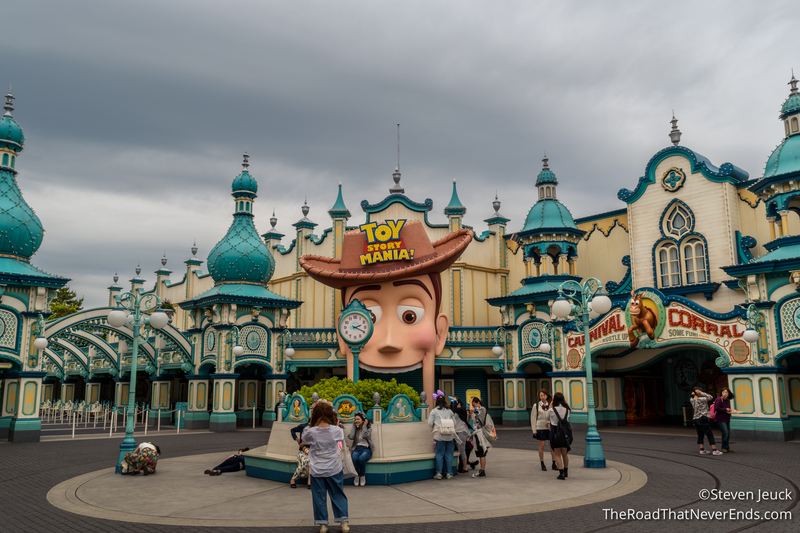 The Toy Story Mania ride is located in the Old New York area with the theme: Toyville Trolley Park. The area also has Big City Vehicles that guests can ride around in (similar to Disneyland’s Main Street) and a stop for the DisneySea Transit Steamer. We also did not go to Turtle Talk, because we have seen in at California Adventure, but also, a kids show in Japanese didn’t sound appealing at the time. DisneySea Electric Railway – This train ride goes between American Waterfront and Port Discovery and reminds me of an old school elevated train (like the L in Chicago). Because the ride was built after 1987, it didn’t have to be a loop train like the Wester River Railroad in Tokyo Disneyland due to Railway laws. We rode this several times, sometimes to just sit and people watch, and other times to get us to a different point. Tower of Terror – Similar to all the Tower of Terror rides, with the exception of theming. 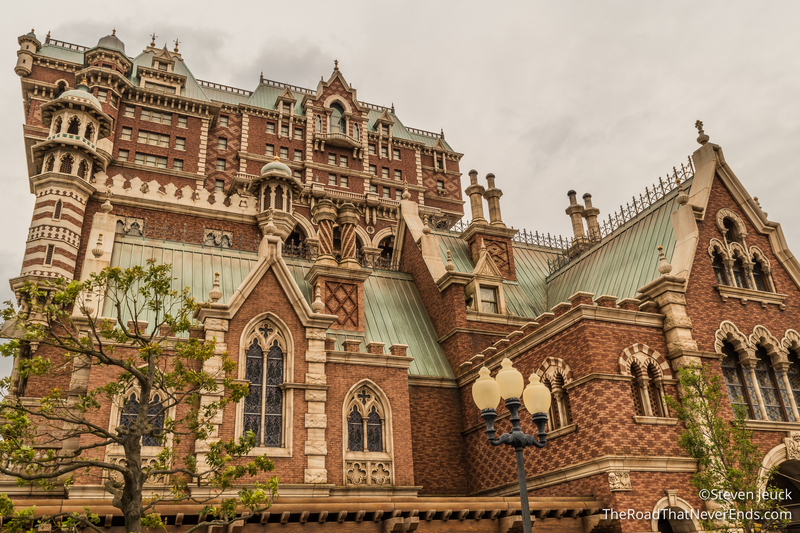 Rather than a Twilight theming, it is themed to an old NYC hotel. The “New York Preservation Society” gives tours to the hotel as it was previously owned by collector of exotic artifacts, Harrison Highwater. During the queue, there are several pre-stories (all in Japanese) but focus on the idol Shiriki Utundu, which supposedly caused the disappearance of Highwater. The queue is unbelievable as there are several fake artifacts. The pre-show room however with the Shiriki Utundu is astonishing – and gave me a whole new set of nightmares. Check out this YouTube video of the preshow – its haunting. I loved this version of Tower of Terror! Port Discovery – This cute little area is small, but it meant to simulate a futuristic port. With the recent addition of Nemo & Friends SeaRider, the area added a “Marine Life Institue” from Finding Dory. The area is packed with creatures from the Nemo movies (which I LOVE). We didn’t spend much time in the area itself, as it was packed with lots of families. The restaurant in this area has the character dining, which makes sense as to why it was packed there. 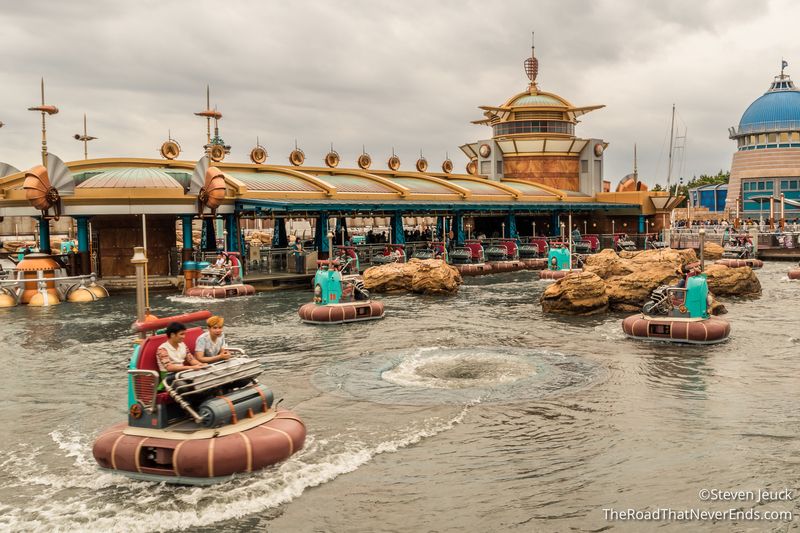 Aquatopia – This ride uses the same technology as Pooh’s Hunny Hunt – the trackless ride system. It is meant to feel like the rider is floating, but, it’s pretty obvious it’s not (for kids it may seem so). We had read that there are hundreds of possibilities for the ride to be different with each visit. This is very similar to California’s Adventure Luigi’s Rollickin’ Roadsters. There is also a “Summer” edition which allows the rider to get wet. I think for me personally; I would rather ride Pooh’s Hunny Hunt or Luigi’s. – this one was a bit lame in comparison. Nemo & Friends SeaRider – This is a simulation ride, where the rider gets shrunken down to interact with fish. The preshow is pretty cute and the ride is even cuter. We had read there are several scenarios so each ride could be different. I was happy to see they incorporated the Finding Dory characters. At one point on the ride a sea otter gave us a hug and the whole ride said “awwwww”. That was my favorite part. Like most simulation rides, I get a bit motion sick, so we did this ride only once. A bit surprising that this ride was not in 3D. The fast passes go out quickly and the line was really long. 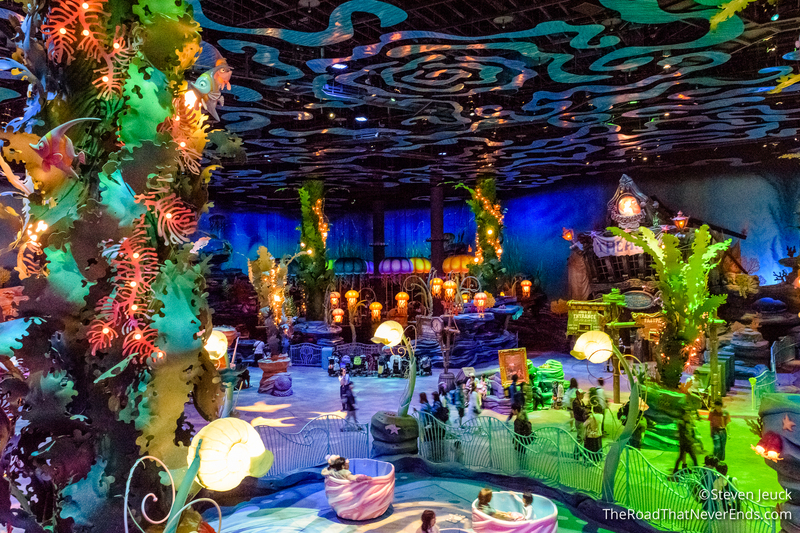 Mermaid Lagoon – This Little Mermaid themed area is a kids dream come true. The area is actually inside King Triton’s castle and simulate like the guest is actually under water. The rides are all for smaller kids including: Ariel’s Playground, Jumpin’ Jellyfish, Scuttle’s Scooters, Flounder’s Flying Fish Coaster, Blowfish Balloon Race, and The Whirlpool (spinning cups). 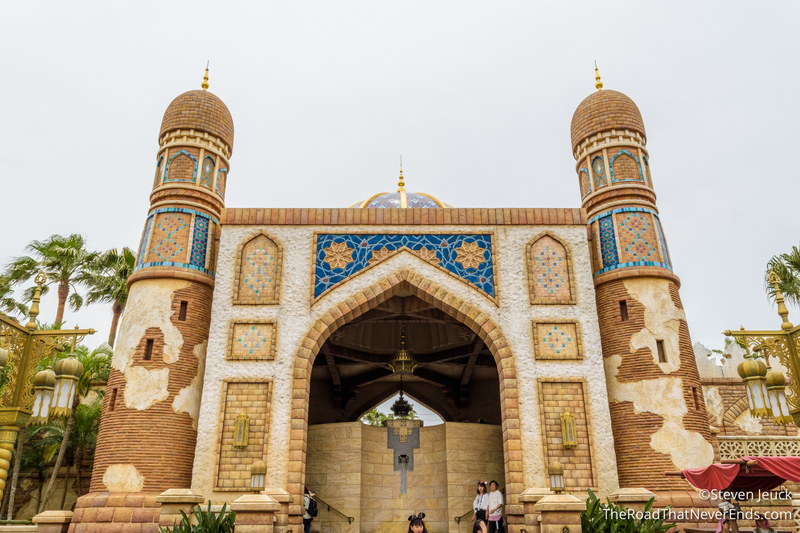 Arabian Coast – Finally! A place themed to the movie Aladdin! My 10-year self is rejoicing! The area has plenty of photo opportunities, characters roaming and our favorite carnival games. The carnival games were bouncing a ball into a cup and balancing a ball downslope to a cup. Steve and I both won giant plush Chip N’ Dale dolls. But we liked the loser prizes better – pins! We ended up playing multiple times to collect the whole Easter set. The area is home to many rides, in which we only didn’t ride the Caravan Carousel – a giant double decker carousel. Sinbad’s Storybook Voyage – The ride is similar to “It’s a Small World” except with follows the adventure of Sinbad. It has original music and the animatronics are spectacular. It is in Japanese, however, the ride attendant gave us the English guide. When we left the park, I had put this on my top three ride list. It was awesome. Jasmine’s Flying Carpets – Lots of fun, similar to Dumbo flight. I believe there is one in Magic Kingdom Orlando as well. 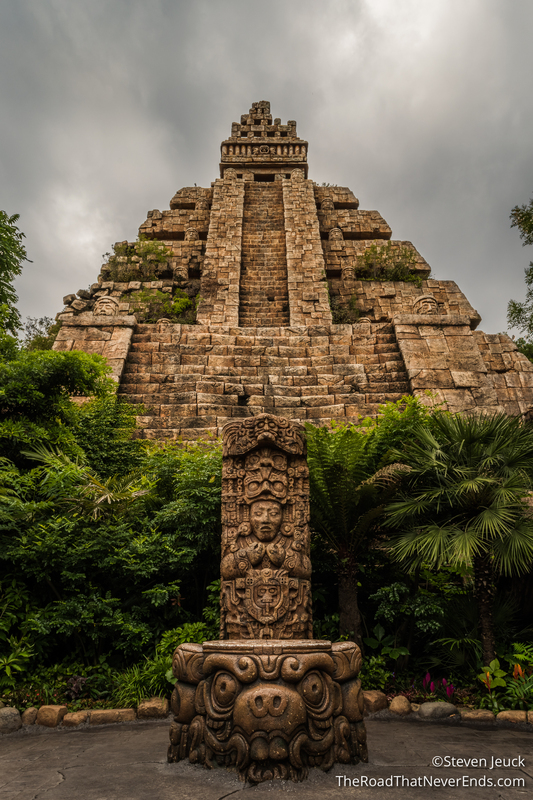 Lost River Delta – Themed to Aztec ruins. The area had lots of food options, shops and two rides. It also is home to the Mickey & Friends meet & greet. Raging Spirits – An upside down roller coaster with fire and fog effects. Steve enjoyed this ride, but I didn’t care for it. We used the fastpass option, however, Steve rode it again using single rider. Indian Jones Adventure: Temple of the Crystal Skull – The ride is the same layout as Disneyland, but with some significant effect differences. The ride is amazing and seems to be well maintained. The entertainment here is astounding. 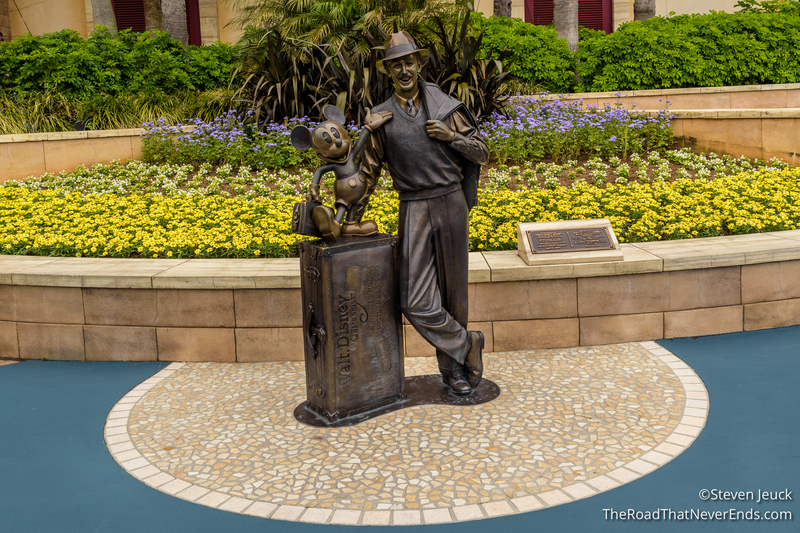 From characters roaming the park, to garbage cans they talk, and a flurry of live stage shows – it is impossible to see it all even in two days. Easter Fashion Show – We visited during their Easter celebration (even in June) and got to see the “Fashion Show” on the Mediterranean Harbor. It was our first time seeing a show on the harbor in daytime – as opposed to Fantasmic and World of Color at night. I thought the entire show was CUTE, from boat floats that stop and unload/reload characters, to ski jets, music and a group of over 50 dancers – this show was SPECTACULAR. I really hope to see a daytime show similar at Disneyland/California Adventure someday. It worked really well, and allowed for many viewers. The Magic Lamp Theater – This is a live action and animatronic based magic show in the Arabian Coast area. The day we went, there wasn’t a wait for the show. I love both magic and Aladdin, so I thought this show was great, except I had no idea what was going on at times because it was in Japanese. Still, lots of fun. King Triton’s Concert – Also a live action and animatronic based show, reliving the story of Ariel. Live action Ariel is hanging from wires attached to a cart on the ceiling (which can move in all directions). The entire time, she was simulating she was swimming. I am convinced she must have abs of steel. The show was in Japanese but since they were retelling the story, it was very easy to follow along. Big Band Beat – This show has a lottery for reserved seating, with the exception of the first performance of the day. We tried both days for lottery and didn’t get in – so we went to the first show. They do have some non-reserved seating for the additional shows, but it is limited and first come, first served. This is probably our favorite Disney show ever. The show’s concept is exploring Jazz from 1920-1950. The show is in English and has an amazing big band. The costumes, dance routines and singers had us in awe. The show also included Mickey, Goofy, Minnie and Daisy – but I would say the show wasn’t cheesy either. I was actually impressed that Mickey has a solid drum solo and it was actually really good. Steve is a jazz lover and left the show quite impressed. Fantasmic – The night we watched it was extremely windy, so they mentioned that the show how to be modified. Regardless, the show is stunning. The floats are similar to Disneyland except with a big more lights. I still think Disneyland is better though. Similar to Tokyo Disneyland – shopping is huge here. Really outrageous prints, colors and ears are big. Steve and I made a decision to treat ourselves – I bought DisneySea ears, and Steve bought a Donald T-Shirt. I regret not going back and possibly purchasing Disneyland ears. 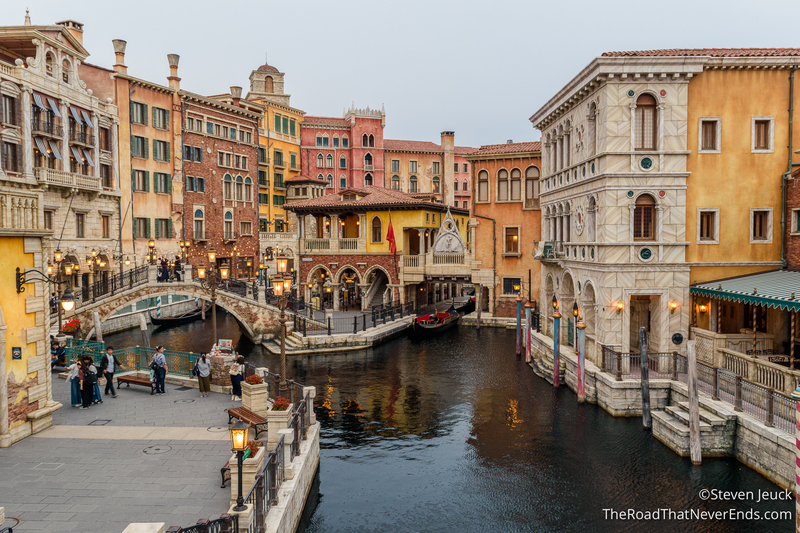 Zambini Brothers’ Ristorante – This Italian restaurant is located in Mediterranean Harbor. I had the pizza and Steve had pasta. The prices were reasonable. 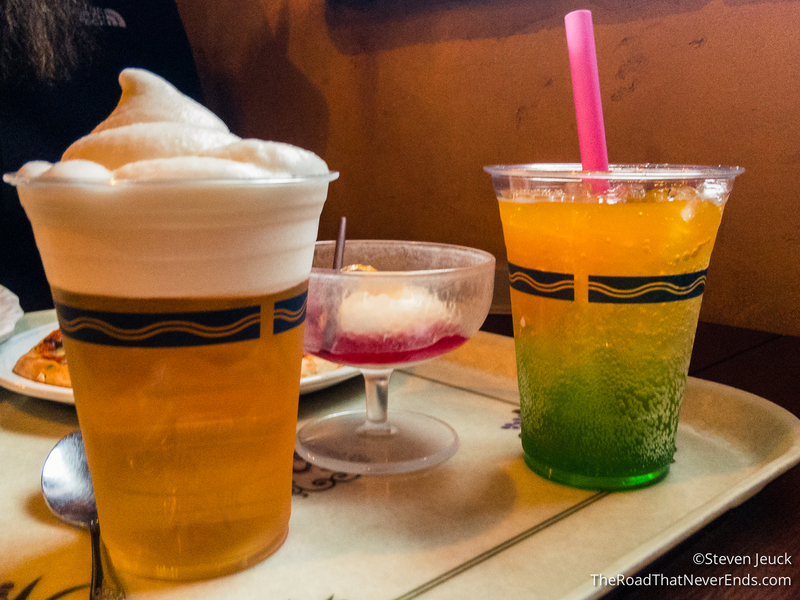 Steve tried “Kirin frozen beer” (a beer with frozen head), a popular item in Japan. Steve’s verdict is “ehhh” and he rather have normal beer. I had a cocktail with bubbles and jelly – and loved it. 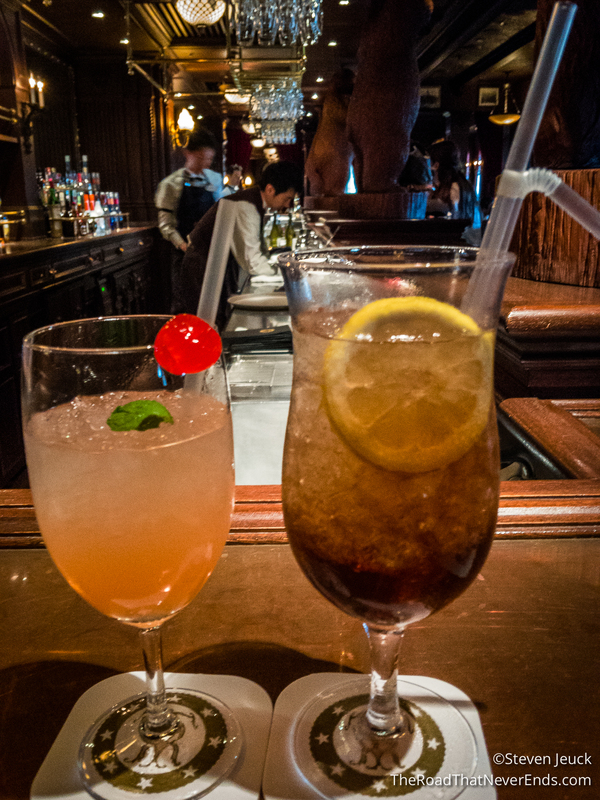 Teddy Roosevelt Lounge – The lounge is DisneySea’s version of Carthay Circle at California Adventure. This lounge has a huge menu for cocktails, served in a fancy style. The lounge is on the S.S. Columbia in the American Waterfront area. The ambience of the lounge is quite sweet – bears, tigers, and everything Theodore Roosevelt might have used to decorate his own parlor. New York Deli – Located in the American Waterfront area – it had delicious sandwiches that really hit the spot for us (as we have been missing American style sandwiches). 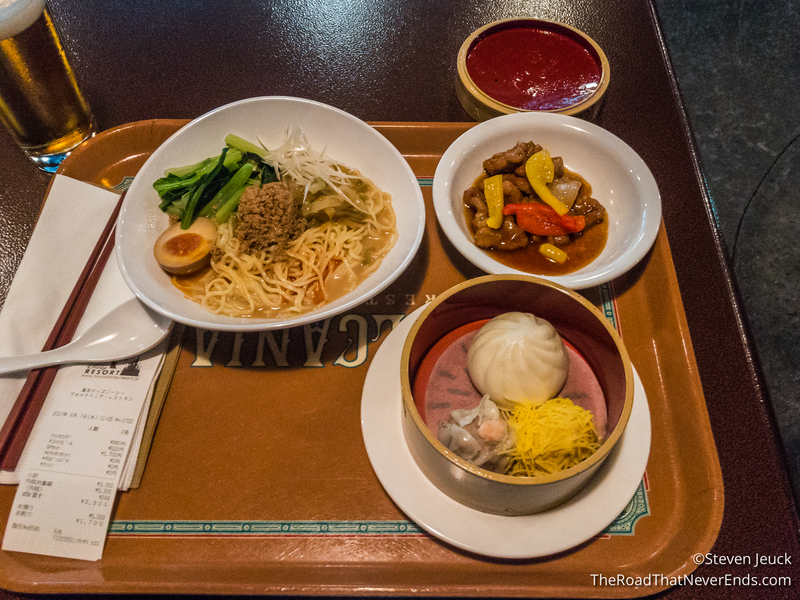 Vulcania Restaurant – We ended up liking this Chinese cuisine so much, we ate here twice. Plus, the décor is like sitting in an underground work station with occasional “quakes” so the room’s lights would flash and fog may come out of the walls. It was pretty fun. 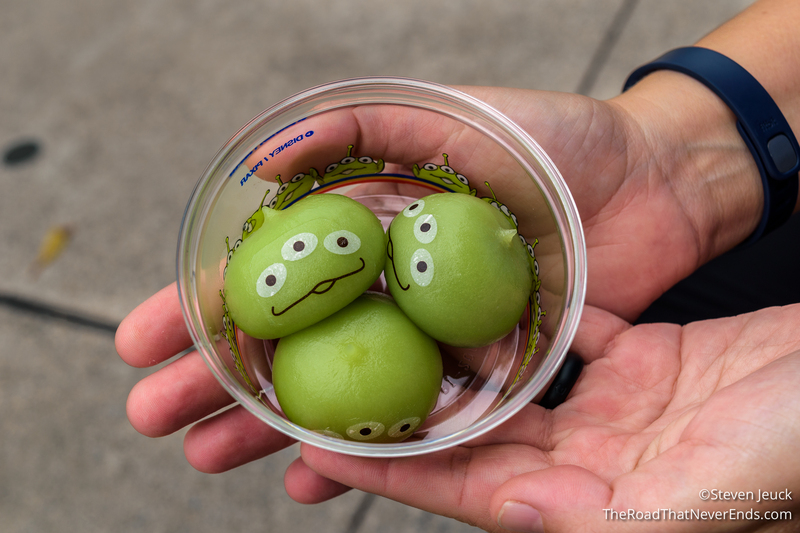 Some other favorite foods include the Green Men Mocha Balls, Bubble drinks in Lost River Delta, and a steam bun hot dog! Delicious! I should also mention (since I didn’t in the Disneyland Post) – Popcorn is a big deal here. Even on the map they show the popcorn stands with a little kernel icon. They have the stands throughout the park with different flavors and buckets. People will collect the buckets and proudly wear them around the neck. Some of the flavors we saw were: soy, milk chocolate, curry, tomato, and more! Duffy, Duffy, Duffy.. and friends – they are HUGE here. Duffy was created originally for WDW in 2002 but it failed. He had huge success in Tokyo – even bumping out the Donald Duck show for a new show “My Friend Duffy”. 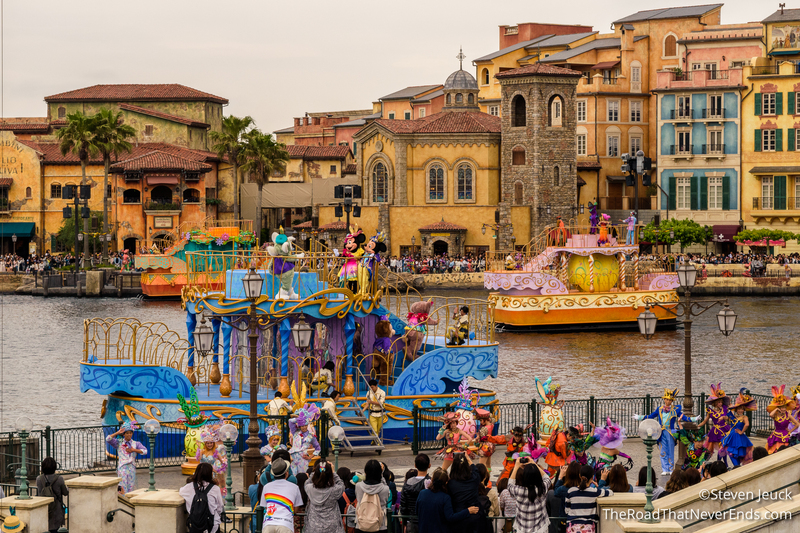 At DisneySea he has a daily parade, his own meet & greet, several (like 5) stores dedicated to his merchandise and a stand in each port for people to place their own Duffy dolls on to take a picture of “their travels”. You can’t walk too far without seeing multiple people carrying their Duffy dolls around proudly. Recently, Duffy’s franchise includes other friends – Stella Lou, a bunny from NY who loves to dance is the newest addition. We found the Duffy craze to be a bit odd, but also enjoyable to watch from the sidelines. Who knows… maybe we will get into the Duffy crazy eventually. 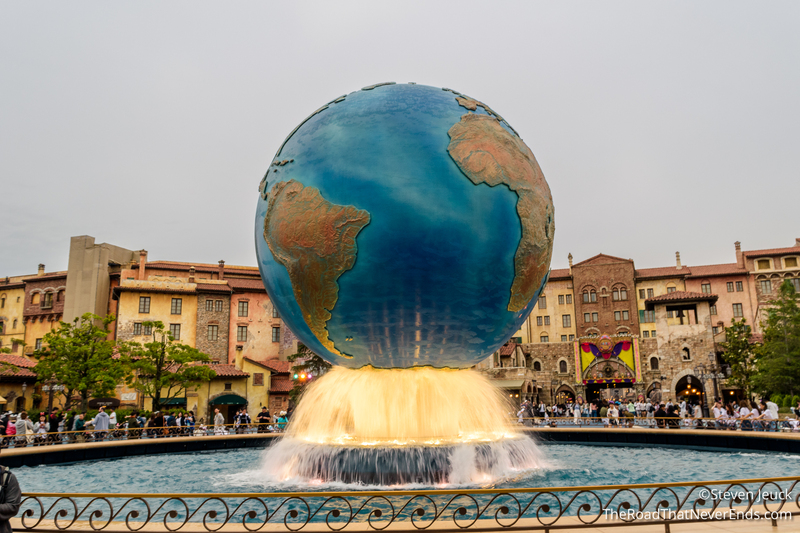 For us, three days at the Tokyo Disney Resort was fine, especially because the crowds weren’t that bad. I can understand why some bloggers end up staying 5 days, because there really is a lot to do and if the crowds are bad, it would be impossible to see it all. 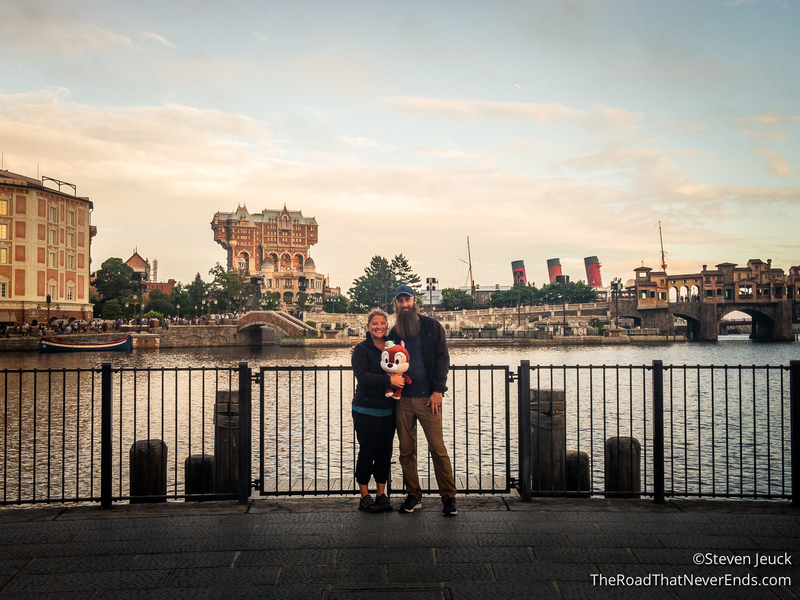 We had so much fun and look forward to returning to Tokyo Disney Resort again!